I hear from time to time about people who have been bitten by the “apologetics bug.” Perhaps they have heard a famous apologist speak or read a great book on apologetics. It may be that they have been challenged on some issue and now realize they need to know more. Whatever the reason, there are some ways to get on the right track. My first tip is a freebie and won’t count for the five. Being interested in apologetics does not make you an apologist. An apologist is one who is active in using apologetics. There are a whole bunch of steps to get to before that. Study your Bible. That may seem too simple but many people like to dive into apologetics and philosophy books without having a good grounding in Scripture. Set up a regular Bible reading schedule. It is not enough to read the Bible once and being done. It must remain an important part of your life permanently. Read some good quality apologetics books. There are so many books to choose from but for a beginner I would suggest I Don’t Have Enough Faith to Be an Atheist, Cold-Case Christianity, How to Talk to a Skeptic and Tactics. There are others that you should read but these will give you a good start. Begin to look for an area of interest. It is too early at the beginner stage to become a specialist, but it is not too early be looking. You may click most with biblical studies or philosophy or science or ethics. There is likely something that you will feel most comfortable. Keep your eyes open. Check your heart. What is it that draws you to apologetics? Is it the love of the argument? Is it feeling smarter than others? These are not good reasons. How about standing up for truth because that is something that God values? Hopefully it also includes love for the people you talk to, whether seekers or Christians with questions. Take baby steps. Start to initiate apologetic conversations. I am not suggesting walking up to a stranger and asking them what they think about the ontological argument. I mean to have natural conversations that have the potential to go deeper than the weather. This is not to be a debate and you will have done well if you do more listening than talking. The point is just to do something. 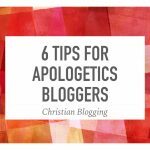 These are just a few tips for those just starting to take interest in apologetics.